"Everything" did not change on 9/11, as some expected, but one thing certainly did: the U.S. government's willingness to preempt enemies before they act. This new policy has outraged so many, it may be discontinued. In foreign affairs, preemption replaced the long-established policy of deterrence. A series of speeches established the new policy, culminating in George W. Bush's June 2002 declaration that "our security will require all Americans to be forward-looking and resolute, to be ready for preemptive action when necessary to defend our liberty and to defend our lives." Nine months later, preemption justified the invasion of Iraq before Iraqis had attacked the United States, to the fury of many. In domestic U.S. affairs too, preemption has prompted great consternation. In keeping with the Fourth Amendment to the Constitution ("The right of the people to be secure … against unreasonable searches and seizures, shall not be violated, and no Warrants shall issue, but upon probable cause"), law enforcement historically has held off arresting thieves until they actually committed crimes. But the 1978 Foreign Intelligence Surveillance Act (FISA), beefed up by the 2001 USA PATRIOT Act, makes it easier to stop terrorists before they act. If there is probable cause that someone is acting as an agent of a foreign terrorist group, without there also being probable cause that he has planned or committed crimes, it allows surveillance – and the resulting evidence. 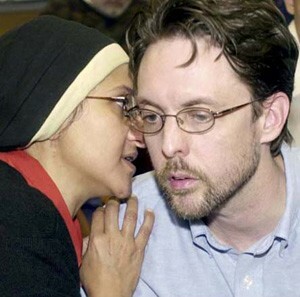 Brandon Mayfield, advised by his wife Mona, addresses the press after his release from prison in 2004. Last week, a U.S. district court judge in Oregon, Ann Aiken, used the case of one Brandon Mayfield, an Oregon attorney who was wrongly accused of terrorism, as her vehicle to declare unconstitutional this key provision of the USA PATRIOT Act. If upheld, her decision to reject prior precedent upholding the act has potentially far-reaching and harmful consequences for counterterrorism. Following the March 11, 2004, bombings in Madrid that killed 191 people and injured 2,000, the Federal Bureau of Investigation tested a set of fingerprints from the Spanish crime scene and generated twenty prints from its system that most closely matched. Mayfield alleges that FBI examiners ran background checks and learned of his conversion to Islam, and that this knowledge biased their examination of his fingerprints, leading to the search of his house, followed by his arrest. He spent two weeks in prison, until the Spanish authorities definitively attributed those fingerprints to someone else. Prayed in the same mosque as did several individuals who pleaded guilty of conspiring to help the Taliban. Helped organize a branch of the Muslim Student Association, a Wahhabi organization, at Washburn University. Represented Jeffrey Leon Battle – who subsequently was sentenced to 18 years in prison after pleading guilty to conspiracy to levy war against America – pro bono in a custody dispute. Advertised his law practice with Farid Adlouni, someone "directly linked in business dealings" with Wadih El Hage, Osama Bin Laden's former personal secretary later convicted of conspiring to murder American citizens. Wrote a letter supporting the Taliban. In addition, Mayfield's house contained virulently anti-Semitic articles, his landline telephone was used to contact Perouz Sedaghaty (a.k.a. Pete Seda), a suspected terrorism-funder, and someone used his home computer to research travel to Madrid, rental housing in Spain, and a website connected to the Spanish national passenger rail system, target of the Madrid bombings. This evidence, the U.S. Attorney in Oregon, Karin Immergut, rightly concluded, "demonstrates that the government and its agents were acting in good faith" when they imprisoned Mayfield. Also, the Department of Justice inspector general found no indication "that the FBI Laboratory had knowledge of Mayfield's religion" while analyzing his fingerprints. But Judge Aiken, a Clinton appointee, exploited law enforcement's misstep to gut the USA PATRIOT Act. That act provides some crucial updating; the Founding Fathers could not anticipate that U.S. citizens one day would support Al-Qaeda, while Congress wrote FISA to counter Soviet espionage, not Hezbollah cells. Should Aiken's view prevail (which it might well not), terrorism will more often have to occur before its perpetrators may be arrested. Practically speaking, we will have returned to 9/10. [Michael Smerconish and I Debate:] What Kind of Airport Profiling? [Brandon Mayfield Case:] "If You Are Muslim, You Are Suspect"